Salads do not have to be boring filled with just lettuce and tomatoes. When you come out to Mulate’s Restaurant, check out our Zydeco Salad. 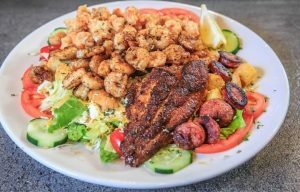 It is a delicious combination of great seafood including: Blackened Catfish, Grilled Shrimp, and Fried Crawfish. It also has Smoked Sausage Medallions, Cajun Spicy Beans, chopped egg, shredded cheese, iceberg and romaine lettuce, purple cabbage, carrots, tomatoes, cucumbers and croutons. So, if you want a healthy salad with a little Cajun style, come into Mulate’s for the Zydeco Salad. Fresh Iceberg and Romain lettuce, purple cabbage, carrots, tomatoes, cucumbers, croutons, chopped egg, and shredded cheese, topped with blackened catfish, grilled shrimp, fried crawfish, smoked sausage medallions, and cajun spicy bean.